Nowadays, most of the ultrasonic coupling agents can only be applied to intact skinm and have no criteria for pathogenic,pyogenic bacteria, or bacterial colony limitation. They have no disinfection effect. Because of this, they cannot meet the clinical needs for reducing iatrogenic cross-infection. 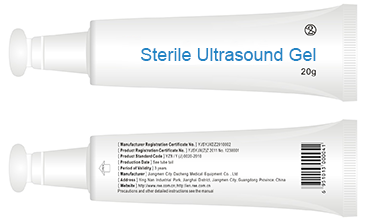 Good stability and lubricity, produces better ultrasonic image, no damage and corrosion to the probe, mild to skin mucous membrane, no irritation,no allergy and no cytotoxicity. Contains anitseptic ingredient that kiss and inhibits the pathogenic microorganisms on the probe introduced due to contact with multiple patients. Effectively avoids cross-infection to ensure the safety for both the patient and the doctor. IOB Ultrasound Gel effectively disinfects. Its sterilizing rate against colon bacillus. Staphylococcus aureus and Blastomyces albicans exceeds 905， which significantly reduces iatrogenic cross-infection. Bacteria colonies count is controlled below 20cfu/g. Coloform, pathogenic,pyogenic bacteria( Pseudomonas aeruginosa, Staphylococcus aureus and haemolytic streptococcus) and fungal colony count cannot be detected. Application for cavity and mucous membrane.